Sterling Silver Raven Earrings by Metal Arts Group. As the provider of knowledge and heroism, the Raven represents transformation and is credited for giving man the sun, moon and stars. A cultural focus of the Northwest Coast People, Raven was known for his trickster characteristics. He loved to tease and cheat other creatures, as well as the coastal people. 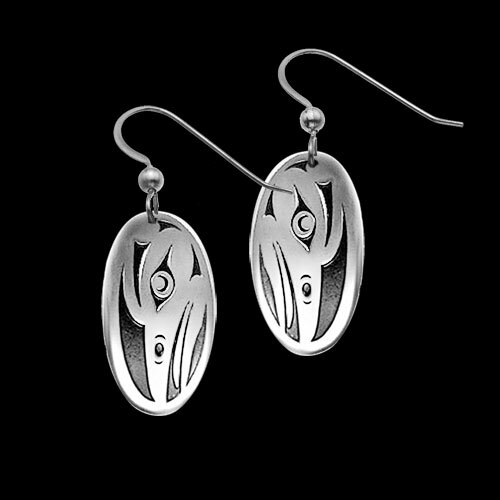 0.9 x 0.5 inch Sterling Silver Raven Earrings by Dale Faulstich. Made in USA. Ships within 10-15 business days. If you would like expedited shipping, please contact Customer Service.